"It's a very sad situation; us homeless people get to see it firsthand," Jason Zazweta tells us. Ask him how easy it is to find drugs and he'll tell you, "Easy as it ever is, and ever was, and ever will be." SALT LAKE CITY, Utah — As we continue our Finding Hope coverage, we're exploring Boise's larger metropolitan neighbor to see how it's combatting the opioid epidemic and what it can teach us about our efforts here at home. 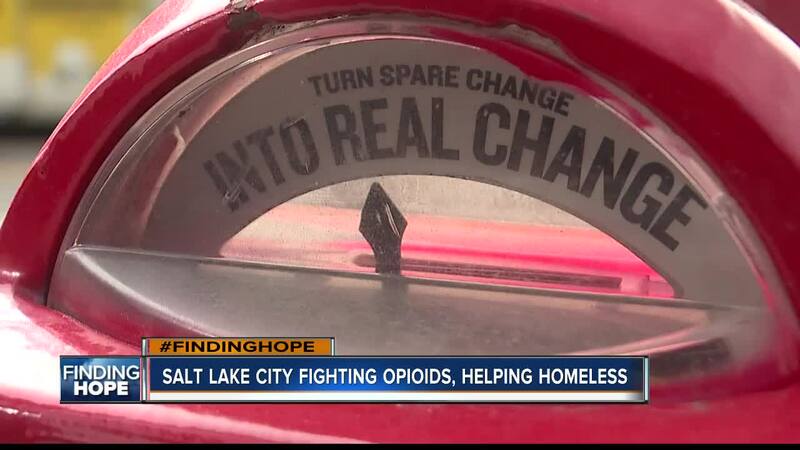 6 On Your Side's Karen Lehr spent several days in Salt Lake City to see how a community much further into the opioid crisis is tackling homelessness, lack of treatment, deadly overdoses and over-prescribing. As soon as we got into town it was immediately apparent--Salt Lake City has a much larger homeless population than the Treasure Valley. We also learned many of those people are dealing with opioid addiction. A quick drive through downtown or a visit to Pioneer Park points out a major problem. "It's a very sad situation; us homeless people get to see it firsthand," Jason Zazweta tells us. Ask him how easy it is to find drugs and he'll tell you, "Easy as it ever is, ever was, and ever will be." Zazweta says he grew up in Inkom, Idaho and has called the streets of Salt Lake City home for more than 10 years. "I was working in the oil field and I tell them I was making more money than most of their politicians working in the oil fields," Zazweta said. "I was a skilled laborer." Jason is an admitted drug addict and says he not only knows many people who've died from opioids, but even recently overdosed on heroin himself--saved by Naloxone. "It's a war on drugs, you know, and it's going to claim more people before it gets better," Zazweta said. But the city has made a significant push in recent years to outlaw panhandling to prevent a thoughtful donation from unwittingly funding a drug habit. Red machines that look just like regular parking meters line many major walkways in downtown Salt Lake City, encouraging donations that entirely go to serve the homeless community there. The goal: turn spare change into real change. "If they're hungry, give them a burrito, a hot dog or a hamburger," Salt Lake County Sheriff Rosie Rivera said. "Don't give them $10 because they will go right down to the corner to buy heroin." Many local stores and restaurants chip in by sponsoring meters in front of their businesses. It's a partnership among city and county law enforcement, along with the downtown alliance and other organizations. 100 percent of the money donated goes to help the homeless. One step closer to what Zazweta says is still lacking in the community. "Compassion, you know, for the addict," Zazweta said. "All you can do is hope and pray for the best." The money raised isn't much. The machines only accept coins, so any larger dollar donations must be submitted online , but Salt Lake City Police say they raise about $1,000 a year just from the meters themselves. That money is then divvied up among shelters and organizations in the city to fund resources for the homeless. Next week, we'll investigate how the state of Utah set aside $67 million for a multi-phase project in Salt Lake City, prioritizing the arrest of drug dealers, increasing access to treatment and ultimately connecting the homeless with housing, resources and employment.